Healthy? Heck no, but trust me: you *need* to eat this. The hus-b is a lifelong ski bum — seriously, he was on skis by his first birthday and has been madly in love with the sport ever since — so we spend most winter weekends at our cabin in Tahoe. After a long day on the slopes, there are few things we enjoy more than a cozy dinner at home with our fellow fresh pow junkies. And given that dinnertime is usually preceded by a leisurely soak in the hot tub and some well-deserved aprés ski beers, minimal meal prep (and knife handling) is beyond essential. Wintry dinners also need to be rib-stickingly hearty, the culinary equivalent of your favorite blanket (and while we’re on the subject of blankets, P&V can’t get enough of these colorfully-named little numbers). Upon reading a recent article on baked ziti in the San Francisco Chronicle, we decided to revisit this much-maligned banquet staple. A substantial one-dish meal with idiot-proof prep and cooking instructions, baked ziti has all of the makings of a perfect aprés ski dinner. That being said, this dish has been seriously bungled over the years by countless school cafeterias and mediocre Italian restaurants. There’s a whole lot to like about a cheesy, heartily sauced pasta casserole, but not when it’s made with overcooked pasta and uninspired sauce. 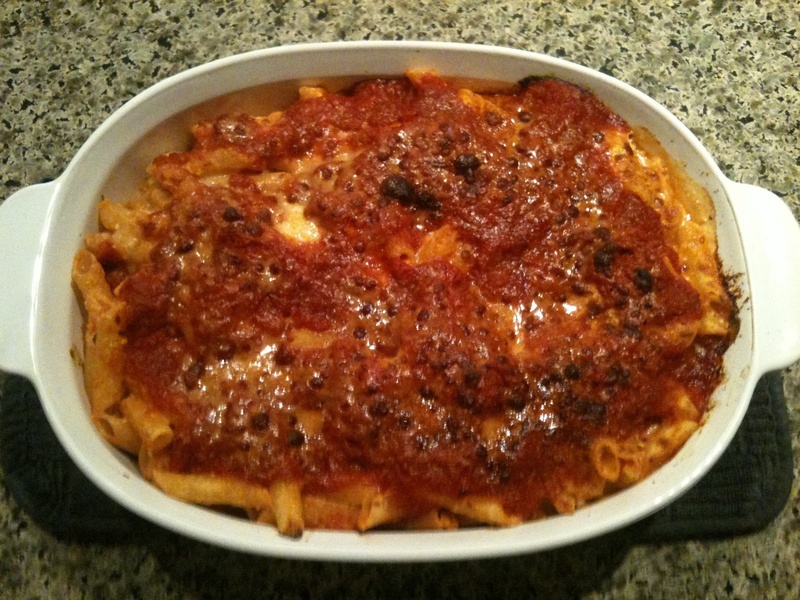 P&V tackled these issues by adapting the Chronicle’s basic vegetarian baked ziti recipe, adjusting the measurements and swapping the basic tomato sauce for a rich, spicy amatriciana sauce. The result? A fabulously delicious and satisfying dinner that even half-cocked, powder-weary ski bums can execute with aplomb. The leftovers allegedly freeze rather well, but we have yet to find out because the dish comes back empty. Every. Single. Time. Heat the butter and olive oil in a large heavy-bottomed skillet over medium heat. When the butter foams, add the diced onions and saute until translucent, about 3 to 5 minutes. Add the cubed guanciale or pancetta and cook until just crisp, stirring occasionally, about 4 minutes. Add the tomatoes with their juices, a generous sprinkling of salt and the chile flakes. Reduce the heat to medium-low and cook for 20-25 minutes until the sauce is slightly thickened. Salt to taste, if needed. Set aside. In a large pot of salted boiling water, cook the pasta until slightly firmer than al dente, about 12 minutes. Drain, and toss with the amatriciana sauce, reserving 1 cup of the sauce. In a small bowl, mix together the ricotta, cream, beaten egg, mozzarella cheese and half of the Parmigiano Reggiano cheese. Carefully fold the cheese mixture into the sauced pasta, moving quickly to prevent the egg of from cooking. Spread the pasta into a 13×9 inch or similarly sized casserole dish. Spread the remaining 1 cup of amatriciana sauce over the top and sprinkle with the remaining 3/4 cup Parmigiano Reggiano cheese. Cover with foil and bake for 25 minutes. Remove from oven, remove the foil and place the casserole dish under the broiler for 2-3 minutes to melt the cheese on top. Serve immediately. A vegan, a health nut and three omnivores walk into a bar.